In college I did research on the Unitarian pastor and scientist Joseph Priestley. Priestley had many interests. He wrote on theology, scriptural studies, language, science, education, politics, and more. Joseph often wrote about the areas where these interests intersected. For example, his interest in language intersected with his interests related to religion and science. Priestley was interested in how humans thought and language’s role in thought creation. I found it utterly fascanating. His interest in language soon became my interest. How do words shape and create our thoughts? I spent a great deal of time pondering this question. My research on the subject led me to believe that we think metaphorically. I believe one could possibly parse most, if not all, of our thoughts into underlying metaphors. We use metaphors all the time without thinking about it. Metaphors frame our thoughts and in turn shape our actions. Eventually, I would read George Lakoff and Mark Johnson’s Metaphors We Live By. The book makes a strong case that metaphors influence the way we think and act. Just as I was getting all excited about how metaphors shape our lives, I was asked to preach a sermon at my home church. Concerned about the use of violent metaphors in our society, the title of my sermon was “Onward Christian Soldiers?” It was the last time my home church invited me to preach. While I no longer spend much time with Joseph Priestley, I do still think about the metaphors we use from time to time. A few weeks ago I was going through my normal pre-church Sunday morning routine when out of nowhere a partial thought flashed through my mind. The words “failure or faith” jumped to my attention. Quickly my mind started making connections with other thoughts in my mind. Over the last few months, I have been very unhappy with the discourse about the future United Methodist church. In that moment, I had some new insight into why our conversations about the future have been bothering me to my core. We are using the wrong metaphors and language to talk about the church. It occurred to me that the language and metaphors of faith are different than the language and metaphors of leadership. In the language and metaphors of faith, we do not talk about failure too much. Faith has other concerns than success like obedience and relationship. Failure is not the opposite of faith. Our ultimate concern, in the language of faith, is not success or failure, but faithfulness. When we use the language and metaphors of faith, its not about us, it is about God. We are concerned with relationship, discernment, and obedience. Judgement is related to how we love God and our neighbor. It is more qualitative than quantitative. Failure comes from the world of leadership. The word sits more comfortably with the metaphors used to construct the language of leadership. While we may be too polite to use the word failure when we talk about church matrixes, ineffective pastors, effective leadership, or church growth, it is the elephant in the room. You cannot talk about success without the possibility of failure. In the worldview of leadership, undergirded by the language and metaphors of leadership, the onus is on an individual to lead people from one place to another. An effective pastor leads a congregation from 100 people to 200. 0 professions of faith to 10 and so on. The desired outcomes valued most are measured. Standards are set. Leaders are judged by the standards. Some would argue this is Biblical. They say God calls leaders. As I have written before, people will lift up the likes of Moses, Joshua, Jeremiah, and so on. The problem with this contention is that this is not a Biblical perspective. Moses followed God and encouraged the people of Israel to do the same. As did Joshua. Where did Jeremiah lead people exactly? When did they take his advice? The Biblical perspective is about following God and God’s way. Jesus did not call leaders. He called followers. What was the criteria he gave? Our Lord called those whom he wanted (Mark 3:13). I think Leonard Sweet hits the nail on the head in his book I Am A Follower where he advocated for language of followership over leadership. In a worldview of faith, the onus is on God. Leaders do not grow the church. God grows the church. When I read the book of Acts, I see the author attributing church growth to God. Does God use the disciples? Yes. I believe God uses the disciples because they were open to God and ultimately obedient to God’s call on their lives. As Rich Mullins, one of my favorite Christian songwriters, once said “we all want to be useful to God. Well, its no big deal. God can use anybody. God used Nebuchadnezzar. God used Judas Iscariot.” Rich ultimately argues it is better to be wanted by God than used by God. John Wesley captures this spirit in his covenant prayer. The metaphors of faith do not focus on failure. They are more concerned about love, obedience, faithfulness, and spiritual fruits. It is hard to understand how one fails in terms of faith. What would that even look like? It is easy to see how fear comes in opposition to faith. Time and time again when you read the bible you see how idolatry butts heads with faith, but failure is alien concept in the langauge of faith. Why then do we use the language of leadership as a church? Do the values and concepts of leadership reflect God’s way? Did the disciples worry about the key drivers to church growth? Or were they more concerned with being obedient to God’s call on their lives? What we say matters. How we frame things in terms of language and metaphors deeply impacts how we live. As a church, if we continue to use the langauge of leadership, we run the risk of forgetting what it means to be a disciple of Jesus. A disciple is not a leader, but a student striving to be like the student’s teacher. In Jesus day, disciples followed their teachers literally. When Jesus ascended to heaven, the disciples waited. They did not set out on their own to create the church. It was not by their own power that the church grew. The disciples waited until, by the grace of God, they received the gift of the Spirit. Empowered and led by the Spirit, they went out to share the Good News throughout the ancient world. I ultimately question whether the languages of leadership and faith can live side by side. The language of leadership places the onus on leaders. Success or failure is judged by worldly standards. Many of God’s faithful servants in the Bible would have been considered failures by the standards of the world. God own Son was a failure in the eyes of the world as he hung on the cross. God does not use the language of leadership. Perhaps we need to spend time unpacking why in our time of perceived crisis we look to the language and metaphors of leadership to save us. 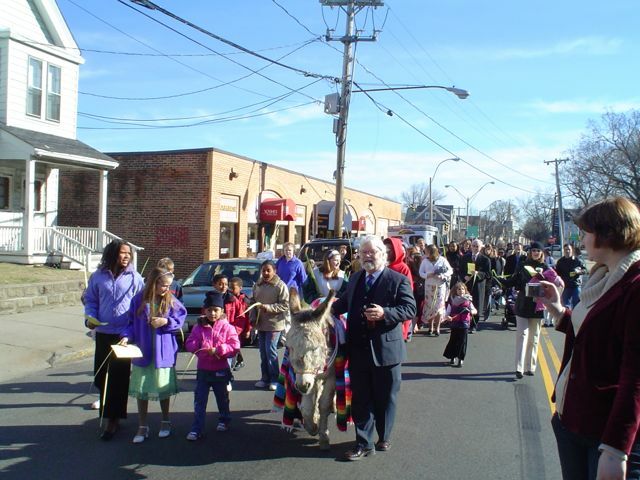 Palm Sunday, Somerville MA 2007.